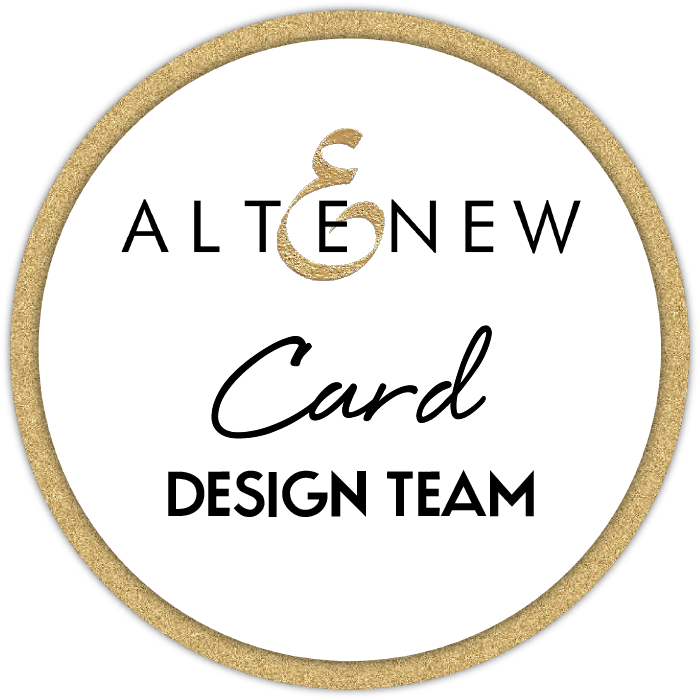 I have a really quick publication share tonight as I’m totally enjoying my holidays and haven’t even had a chance to make any cards yet! I also just got back from a visit to my brother and SIL in Gladstone (only a 8 hour drive away) but it was so nice to see them, we ate way too much they have the best Indian restaurant across the road and to be honest it’s worth the drive lol. 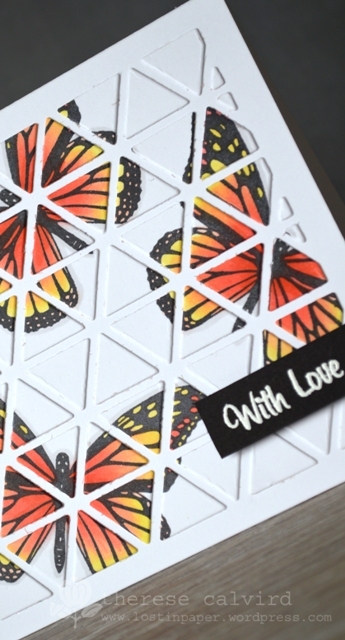 So I thought I would share this publication for The Australian Cardmaking, Stamping and Papercraft magazine where I was asked to use one die… four ways and this is what I came up with using some fab MFT products (my apologies in advance for the photo heavy post). 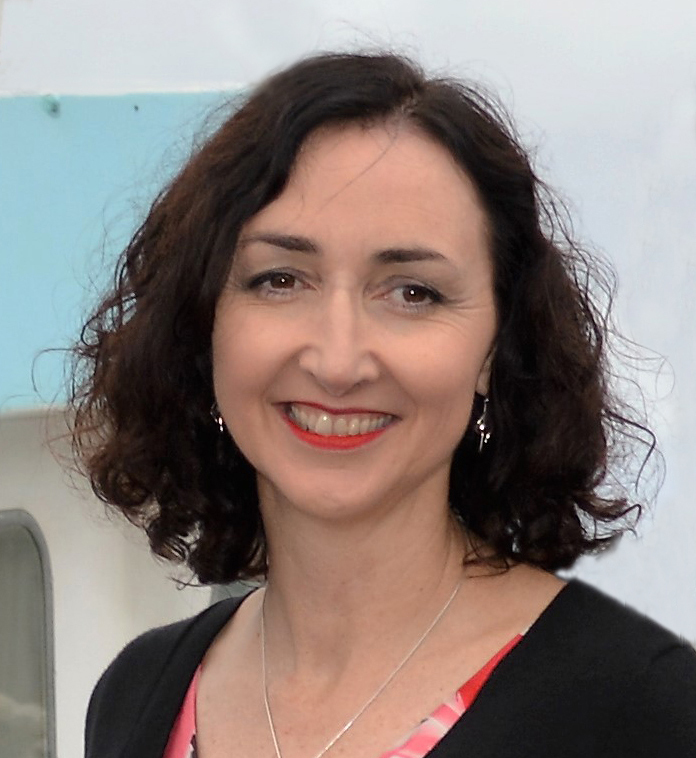 Hopefully I get some home time now and you might see some new cards, but I pick up my new Scooter tomorrow so I might actually be out with the wind in my hair instead. 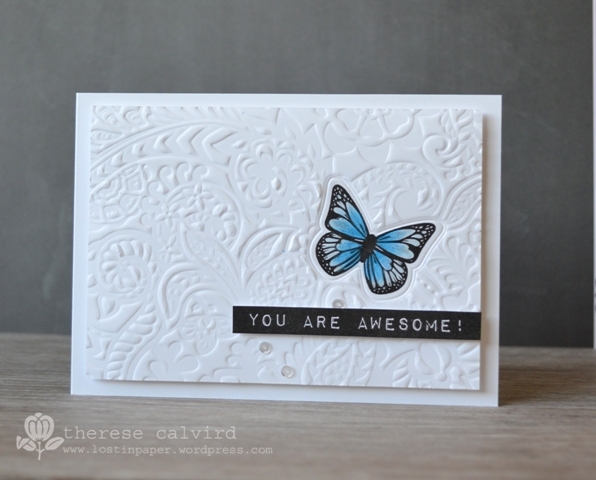 Other Supplies: Rubber embossing mat. Sequins. Prismacolor Pencils – Peach, Yellow Ochre. Copics – T0. 0. W2. Y11,13,21,26. R02,05,22. 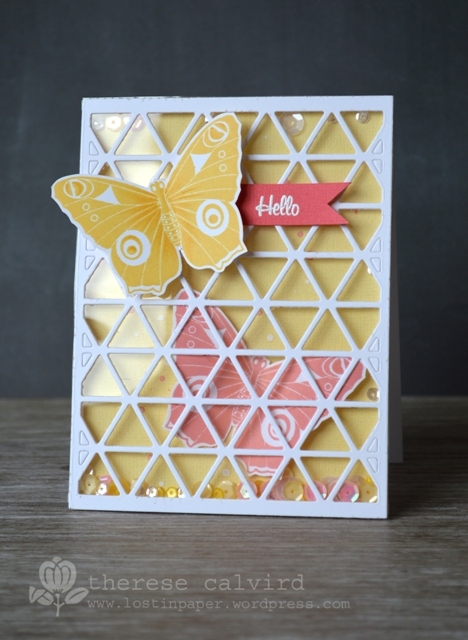 SBB Cardstock – Butter, Grapefruit. Foam Sheet. 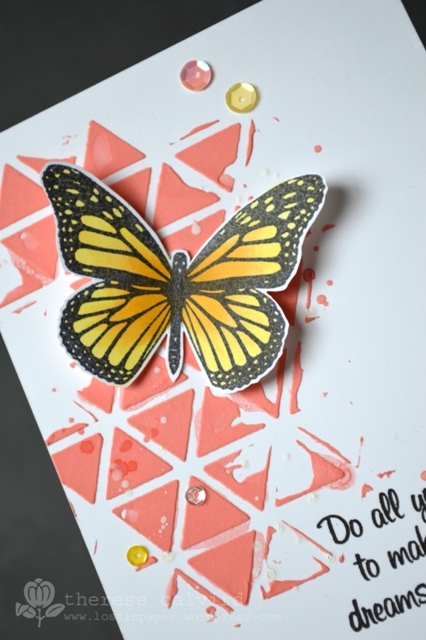 Video : Butterflies within a Butterfly? 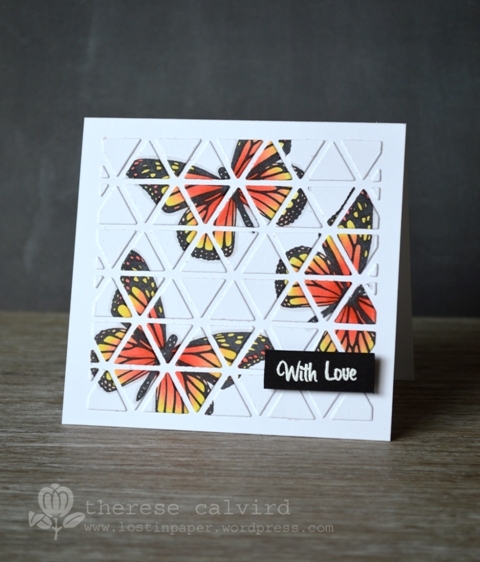 Playing with some fun Penny Black products today and I had an idea…. I filmed as I created so you can see the process. 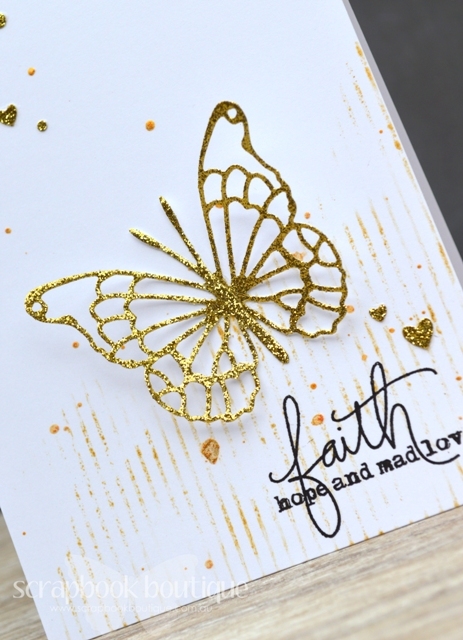 I’ve linked the products from Penny Black that I used below. Can’t wait til next time! Other Supplies: Copics – B000,02,24. BG11,13,15. BV00,02. 0. 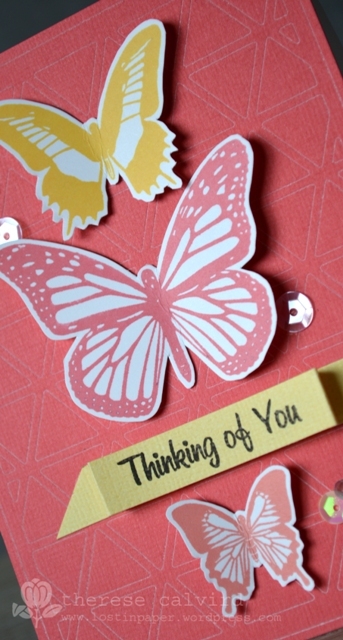 Playing with some glittery die cuts at Scrapbook Boutique today and I’m loving the lack of glitter on my workspace, clothes, face… well, you get what I mean lol. I filmed as I created just in case you wanted to watch. I’ve listed all the links to the products below or you can head on over to Scrapbook Boutique and go shopping yourself. 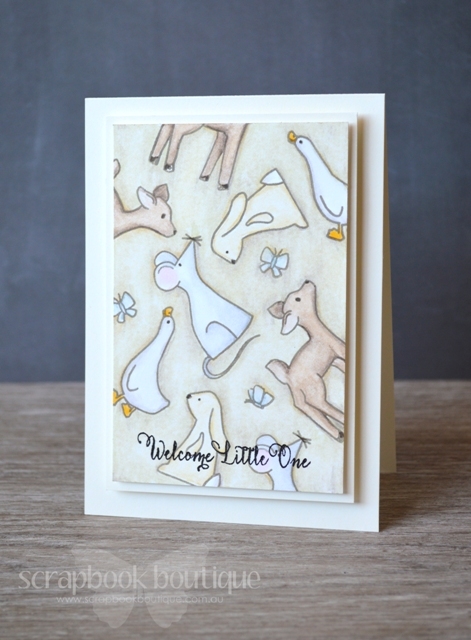 Welcome Little One at Scrapbook Boutique (video)! 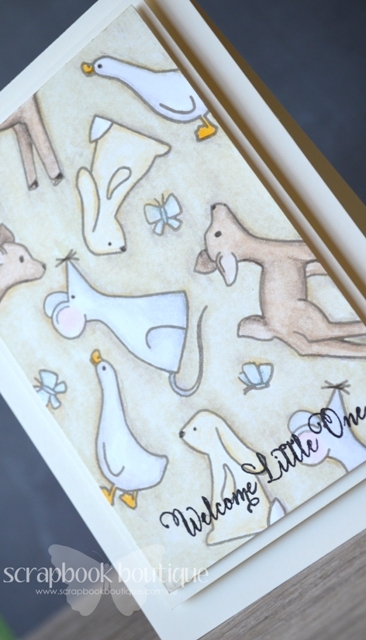 Back today with another card for Scrapbook Boutique. 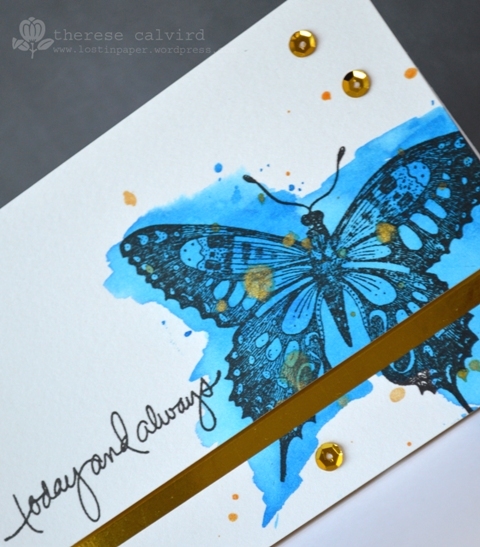 I’m addicted to Avery Elle stamps and when I saw this set I just had to have it… and of course the matching dies (wink). I decided to film as I created just in case you wanted to watch. 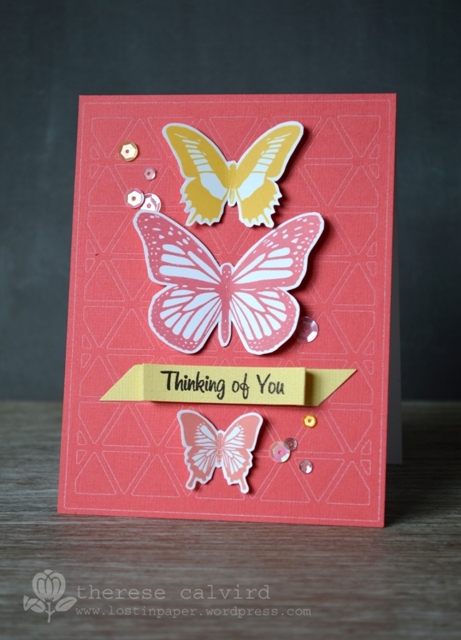 Other Supplies: Prismacolor Pencils – Pink, White, Jade Green, Cloud Blue, Warm Grey 20%, Cool Grey 20, 50%, French Grey 50%, Putty Beige, Cream, Sand, Beige, Goldenrod, Light Umber, Sepia, Ginger Root. Today and Always in Gold! 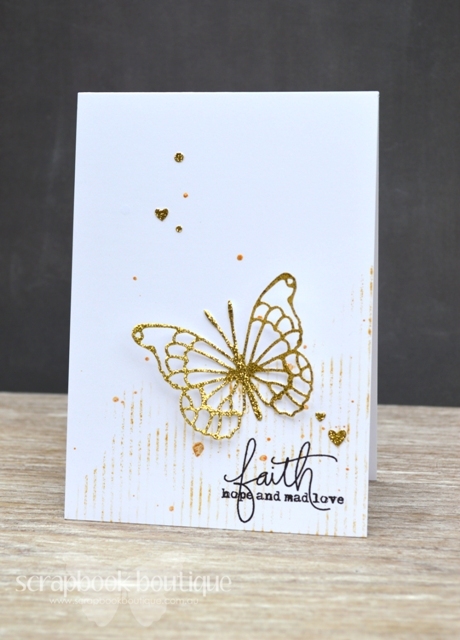 Today I have a publication share and with the call being for ‘Gold’ I couldn’t resist. 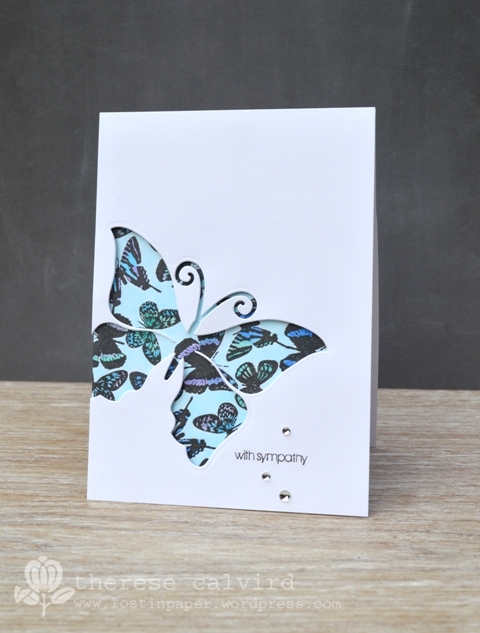 So a few splats here and there, some sequins and my all time fave butterfly and I was in card heaven. ps sorry about the dark photo, the gold really did sparkle! 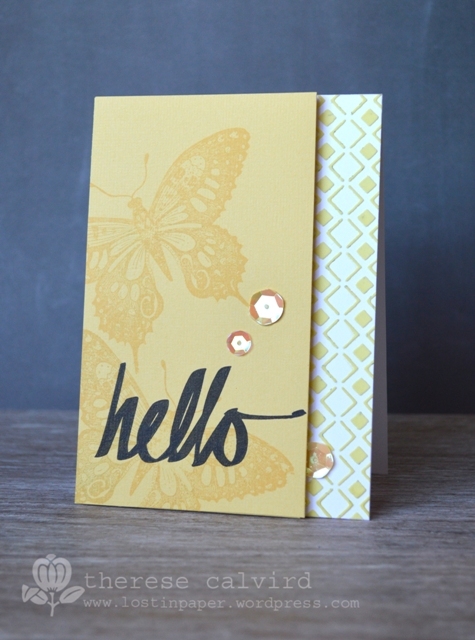 Other Supplies: Cardstock – Gold mirror card. 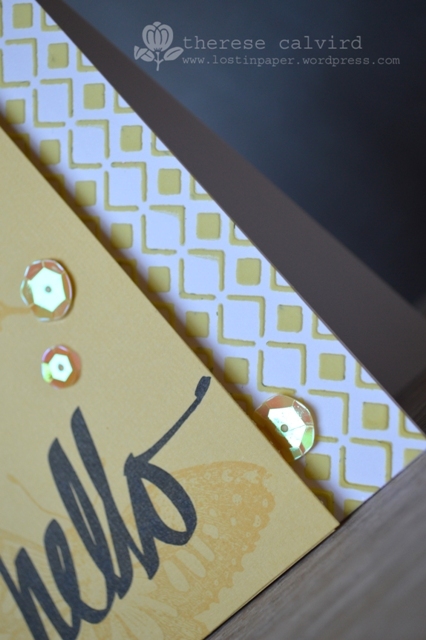 Gold sequins. 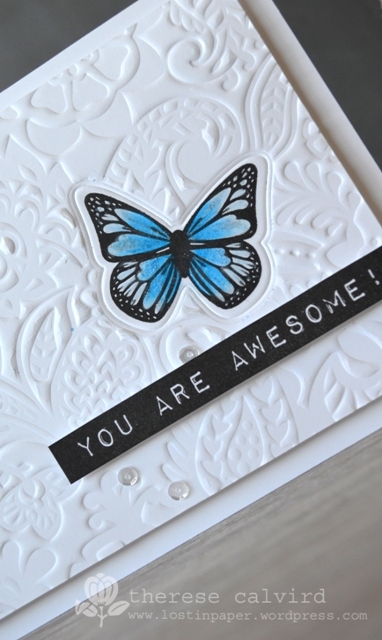 Embossing with Dies at Addicted to Die Cutting! 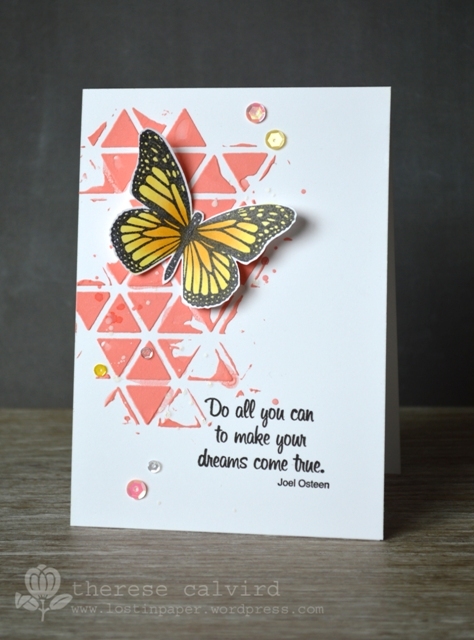 This week’s technique for my Addicted to Die Cutting series is a fun one and seriously a great way to get more from those dies. 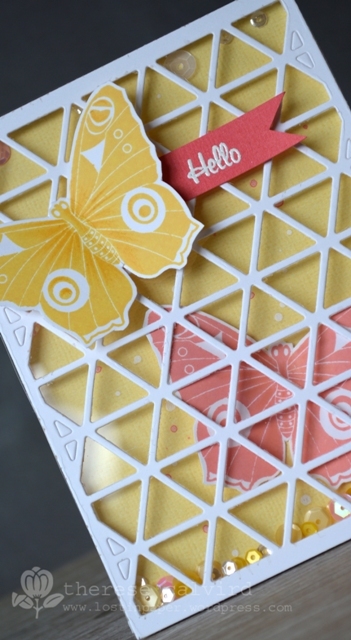 It’s embossing with dies, kinda like creating your own diffuser! You may have noticed that I have been MIA at the moment, I’m somewhere on a beach camping and visiting with friends, totally off the air. But I’ll be seeing you real soon, til then, Cheers! 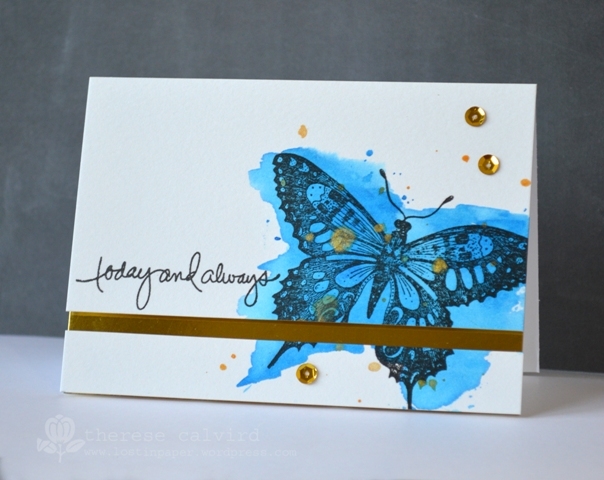 Other supplies: Prismacolor Pencils – Powder Blue, Light Cerulean Blue, True Blue. 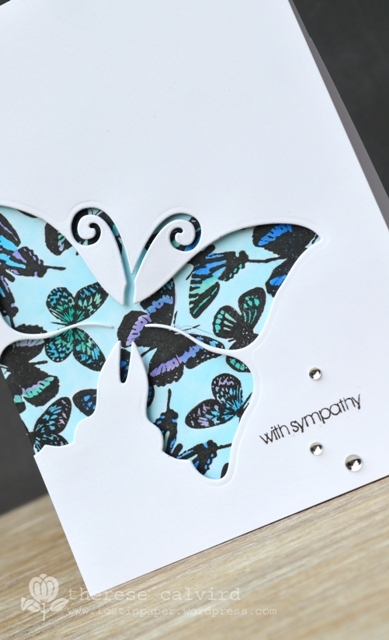 Embossing Folder – Sizzix Tropical Paisley.